For at least the next several weeks we have a three-part kitchen. The refrigerator is still where it belongs, but next week will be heading to the garage. Our prep space is on a long craft table set up in the dining room in front of the window – where until recently I took photos to share with you. We have the bare necessities there – the sorts of things you’d likely find at a campsite – well, okay, maybe an RV park, minus the generator. The clean up space (and the nearest water) is in our laundry room, about 100 yards (or more) away from everything. That’s also where we keep our espresso machine, because how could we consider going camping without it? Between the clean-up space and the prep space are some stairs. On this side of the stairs are our dogs. On the other side of the stairs, a demolition crew going in and out the front door. Separating the two, at the base of the stairs, is a dog gate that I climb over with arms full of food, cutting board, salad bowl, etc etc etc. If you had a few minutes and you’re into pratfalls, you’d get a kick out of it. I’m bringing armloads of stuff to my office to prepare a salad and then to photograph it. So as you can imagine, there are a lot of “steps” involved in preparing something around here, especially something to share with people of such enormously good taste as yourselves. A lot of “foot-steps” that is. Apart from that, we’re keepin’ it simple around these parts. Here it is another Wegetable Vednesday and the show must go on! 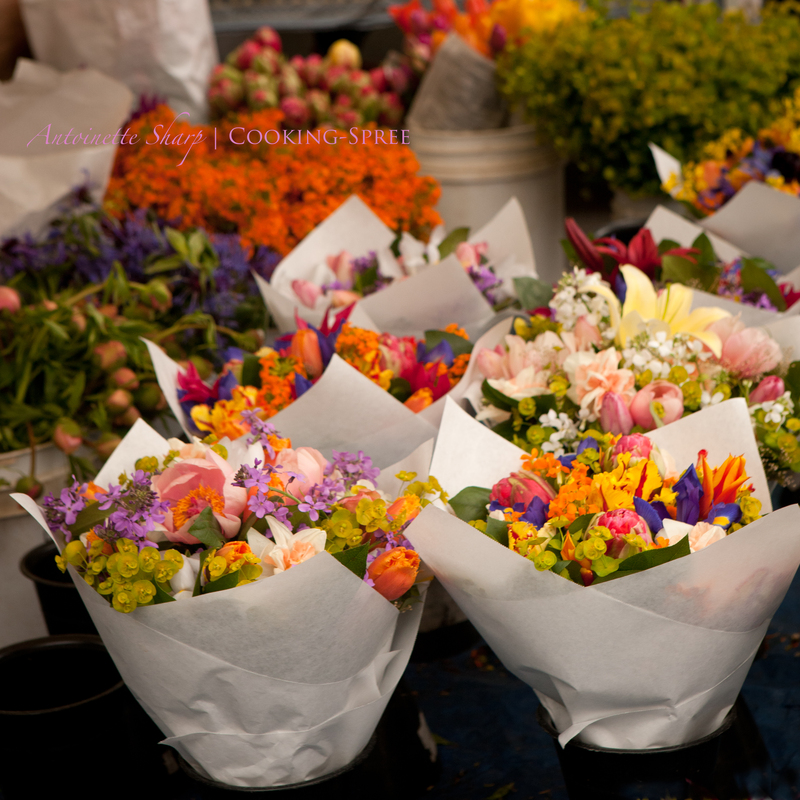 This morning I headed to another one of Portland’s Farmers’ Markets, and this time I brought big girl camera and cash. This market too is on Portland’s park blocks, but smaller, cozier than last week’s. And, sadly, no fiddles. But there were glorious flowers and loads of beautiful vegetables and herbs to choose from. I’m kind of a freak for salads, so I head to the greens first. But I’m apprehended by the perfume of fresh bouquets of mint and tender pillowy leaves of basil. And the greens, half of them were shades of purple! How could I resist? Another vender was selling goat cheese. Into the basket. (See those orange beets in the photo above? Those made it home too, but didn’t make it to the salad.) 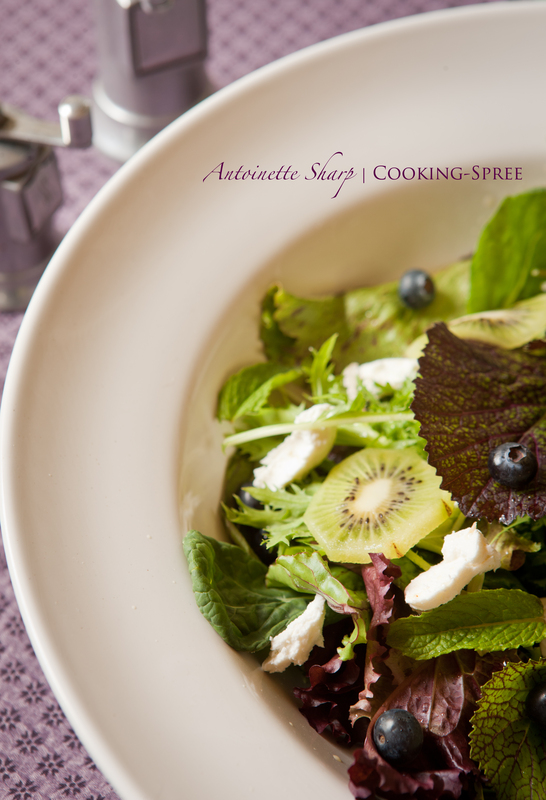 What did make it into the salad: the greens & the purples, the goat cheese, mint and basil, some plump bursty blueberries – and kiwi just ripe, back at our campsite. They got tossed into a bowl, drizzled with olive oil and (blueberry infused) balsamic. But never mind if yours isn’t blueberry flavored, any balsamic you love will do! A little salt and pepper, glorious! Took a few photos then feasted simple! Spree has been packing. She’s nearly done and will be returning soon. Things won’t look quite the same for a while as most of her stuff is buried in boxes. She asked me to apologize to her bloggy friends too because she hasn’t kept up on her reading. She asked that I say please don’t take it personally, and that she misses you all, and that she’ll invite you to dinner as soon as her kitchen is finished. Your photos are glorious Spree and so is your delicious and inspiring salad! I can only imagine the craziness of this reno – best of luck with it all and enjoy the process! xo! Thank you Shira! The morning clouds hadn’t burned off yet so all the colors were so Saturated & Yummy! And the reno – well, it “complicates” things for sure, but I’m having a great time with it actually! (check back in 6 weeks. 🙂 ) Honestly, I love something that challenges me to think differently, to stretch, to be innovative, so so far so good! 🙂 xo! Such a beautiful post, Spree! 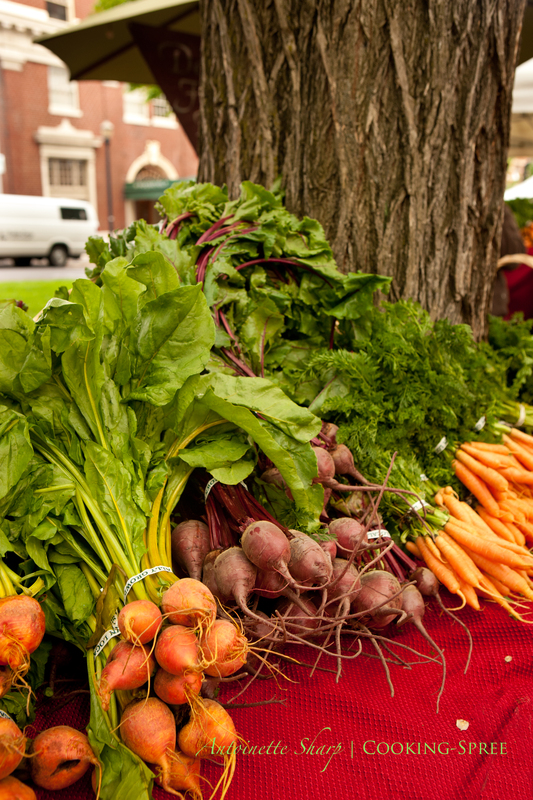 This was the kind of trip I had envisioned by myself last Sunday when MY farmers market opened for the season. Unfortunately, it rained and my leisurely stroll was a 2 minute dash to one stall. I did manage, though, to get ramps, asparagus, and a rosemary bush. This is really fun following your adventure! Love your detailed description because I got a visual of the process and it made me chuckle :):). Might this be the farmer’s market by the Portland art museum? Beautiful salad that my mom & I may make tonight. Look at those flowers wrapped in paper. Oh, sorry — your salad is pretty, too. There may have been more flowers than fruits and vegetables – we shoppers were ringed by them. How lovely a fragrant hug! I love the colors of those bouquets, followed by the colors of the veggies. The salad sounds so simple and yummy — I felt strangely comforted by the fact that you didn’t use exact amounts. As you said, this is camping after all! Camping skills a bit rusty Ashley, but they’re coming back. By the end of the week, s’mores! I enjoy all of your pictures and descriptions. However, I really love your Sri Lankin Fish Stew. It has become a fave at my house! Nisi, so nice of you to comment! It’s always great to hear feedback on recipes I’ve posted. I’m happy to know you like it – we do too!! Good luck with the remainder of the kitchen refurbishment. Salad looks great as does the market. Thanks Roger.Pretty excited, but having to “cool my jets” as completion’s quite a ways off yet. Well I haven’t posted MUCH lately, as you’ve noticed, and this latest really was a comedy of errors! 🙂 But thank you Tanya – it sure did feel wonderful to be in that market wandering! Great looking salad – I’ve never seen kiwi in a salad before. When we did our kitchen at the end of last year we literally gutted it, so we only had a microwave to cook with… No much blogging got done. Great photos. Everything looks fantastic! Everything at the market looks tempting and wonderful. The salad , scrumptious. We have a friend from the Philippines who puts avocado in fruit salads. Have you ever seen that? Such beautiful photos, and those beets look wonderful. Good luck with your renovations. I’ve recently gone through the chaos myself (unfortunately, I was renovating to prepare my house for sale, so I didn’t get the benefit of all the disruption, other than my house sold on day one). Anyway, once it’s done you’ll be so glad and you’ll have some really great and funny stories to tell (even if they don’t seem so funny right now). And by the way, if that salad is ‘camping out’ food, I’m going to pitch a tent! Oh thank you Mar! My husband and I considered exactly what you’re saying – and opted to remodel well in advance of selling so we could enjoy it ourselves before turning it over to another. A little bitter sweet for you – and yet how great that for you it meant a quick sale!! That’s worth a WHOLE LOT (as you well know!) 🙂 I’m looking forward to the stories to be told one day – I’m sure some will have us in stitches. Thanks for your sweet comments! In can sympathize with you. When we redid our kitchen in Florida, my stove was my gas grill on our back porch and dishes were washed in a pedestal sink and drained in the shower of our pool bathroom. Love the photo of your salad. Well then Ms Smidge! You and I really ought to go camping! (But only if you can bare to part with the weenies!) xoxo! I’m making this this weekend at Luke’s birthday party for the “da-dults” as Luke calls us, big people. Can’t wait! !